'Which Bible translation is the best to use or to buy?' 'Which does the Church recommend?' In Choosing a Bible Translation, John Pilch discusses two kinds of Bible translations: word-for-word (literal or formal correspondence), and meaning-for-meaning (literary or dynamic equivalence) and comments on the merits of each for the needs of Bible readers. Pilch also emphasizes some challenges that translators of the biblical texts face such as the use of inclusive language, social systems, textual variants, and sensitivity to cultural awareness. He provides readers with a host of resources for choosing Bibles on computer software, obtaining electronic copies of translations, and for locating translations on the Internet. John J. Pilch, a highly-regarded biblical scholar and author, taught at Johns Hopkins University in Baltimore, Maryland and passed away in 2016. Among his numerous publications are The Cultural World of Jesus, The Cultural World of the Apostles, and The Cultural World of the Prophets series published by Liturgical Press. If you're in the market for a new Bible for yourself or someone else, this will be useful. In 24 pages it goes through the different kinds of translations and which translation is more suitable for serious study or for enjoyment. John Pilch has produced a helpful guide through the maze of competing translations that will allow students of the Bible to choose intelligently according to their own needs and interests. A wealth of information and insight is packed into this short book. . . . Pilch combines a remarkably clear and interesting writing style with his scholarly insights, making this an invaluable tool for teachers and students. A lively survey by an expert of the range of biblical translations available today and an eye-opening, reliable guide to the versions best for meditation, serious study, and public reading.
. . . gives a very careful analysis and practical suggestions to assist one in finding a suitable English version of the Bible for personal use, in either study or devotion. 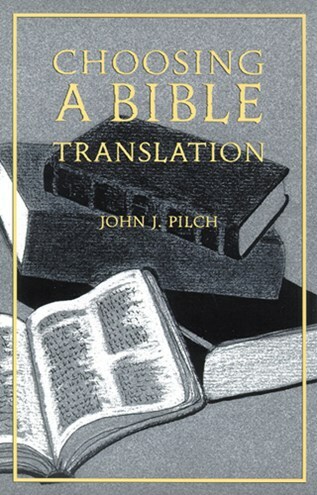 At a time when there is a confusing number of translations and paraphrases of the Bible available this book has appeared as a very welcome guide for the general reader. . . . Top marks for Pilch for producing this accessible and valuable guide. It is brief without sacrificing substance.